Russia has announced two new milestones in its ‘Proryv’, or Breakthrough, project to enable a closed nuclear fuel cycle. The ultimate aim is to eliminate production of radioactive waste from nuclear power generation. 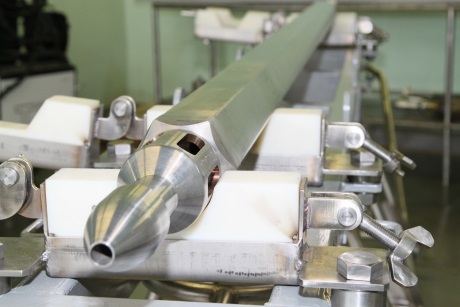 Siberian Chemical Combine (SCC), based in Tomsk, said yesterday it has completed testing of the first full-scale TVS-4 fuel assembly containing nitride fuel. The assembly is intended for the BN-600 fast neutron reactor, which is the third unit of the Beloyarsk nuclear power plant. Vladimir Troyanov, chief production engineer of the Breakthrough project, said the materials used for the TVS-4 fuel assembly "possessed higher radiation stability that permits a substantial increase in its service life and, in turn, the efficiency of fast neutron reactors." The product that is to follow - TVS-5 - is being designed for the pilot demonstration reactor BREST-OD-300, which will built at the SCC site, Troyanov said. BREST-300 is a lead-cooled reactor system developed by the N A Dollezhal Research and Development Institute of Power Engineering (NIKIET). Meanwhile, Krasnoyarsk-based Mining and Chemical Combine (MCC) said on 16 September it has produced the first industrial batch – 10 kg - of mixed-oxide (MOX) fuel. MOX is a mixture of plutonium and uranium dioxides. Tablets of the MOX fuel will enter serial production for use at the BN-800 fast neutron reactor, or unit 4 at the Beloyarsk plant, which is in the Sverdlovsk district. A MOX production line, now undergoing start-up and adjustment, was assembled in a mine 200 meters underground at the MCC site and will become fully operational by the end of 2014, MCC said. SCC and MCC are both subsidiaries of Russian state nuclear corporation Rosatom.